Home / News & Events / News / Giving thanks! Sociology Department's Science and Justice Research Center and Student Research for Community Action, part of the "No Place Like Home: The Affordable Housing Crisis in Santa Cruz" thank you for supporting student scholarship! 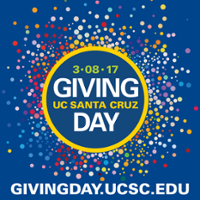 Missed your chance to give on Giving Day? It's not too late! You can donate anytime. To support our students and keep our vital work going, the Center for Labor Studies and the Science and Justice Research Center are raising funds to support summer student scholarships to continue their work. To make a contribution donate now!